I am still struggling to work out what to call this. It is Isopeda montana species group. 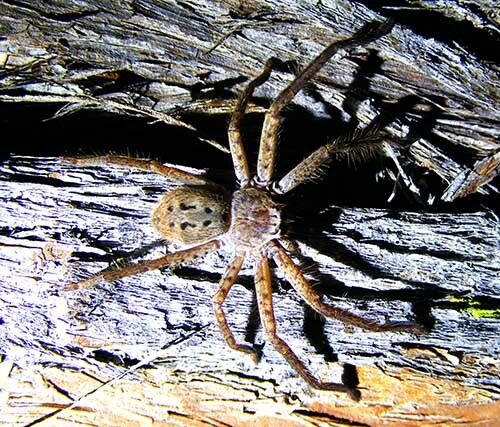 This speciemen is about 3 cm across the span of its legs. It is a nocturnal hunter. Thanks to Robert Whyte (Arachne.org) for deciphering the information and identifying this guy and to David B Hirst (South Australian Museum)for doing the research and the paper being used to work it all out. (it look a lot like Chinese to me though) I had been identifying all the similar specimen as Isopeda vasta and not realised I was seeing what may have been several other species. I can see this entry and a few others changing as the days go by and my previous assumptions are wiped away. March 2013 Bateau Bay.